A century-long legacy of tending the flock. John Lehfeldt pauses to stretch his aching back before leaning into a tiny wooden pen, scooping up one of a pair of hours-old lambs. He dips a short handled number branding iron into a vat of orange paint and deftly imprints two bright threes perpendicular to each other on the newborn’s ribs. The lamb’s twin and mother get matching marks, grouping an otherwise nondescript family unit together before they’re turned out in sagebrush-dotted pastures with the herd. Moving to the next pen, John repeats the motion, this time stamping a three on each hip. He continues through a series of variations in placement and position with the three iron before switching numbers and eventually paint color as he methodically moves through the roughly 140 pens of lambs that dropped in the last 24 hours. “They used to brand one through 100 and then switch paint colors,” he explains as he plugs through the marathon task he repeats daily during lambing season on his Lavina, Montana, ranch. “This way I’m not having to switch irons all the time and I can get the job done faster.” It’s a system passed down and perfected over multiple generations as a way to help organize the otherwise monochromatic mass that is the family’s 2,800-head Rambouillet-Merino cross sheep herd. 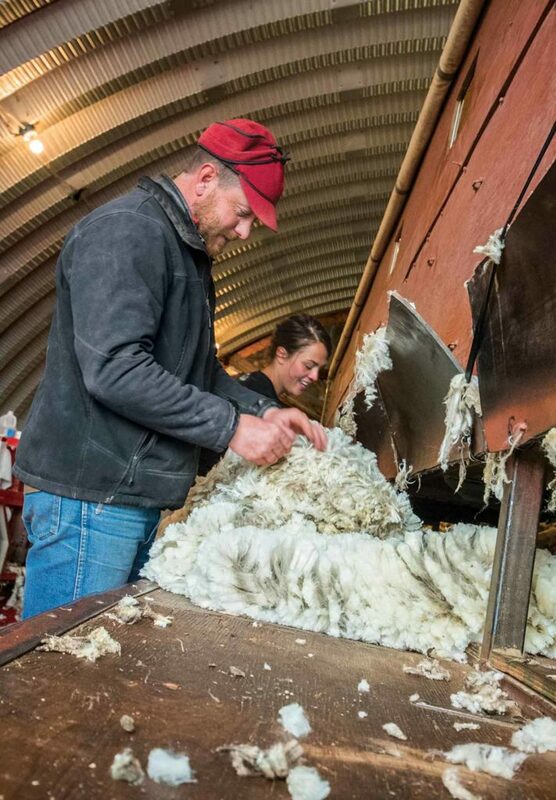 Erik Lehfeldt checks in on shearing. His breeding program produces 19 micron extra-fine wool perfect for producing textiles soft to the touch. In every task being performed by family and hired help alike there are hints of tradition and a level of knowledge and herdsmanship hard earned over more than a century. 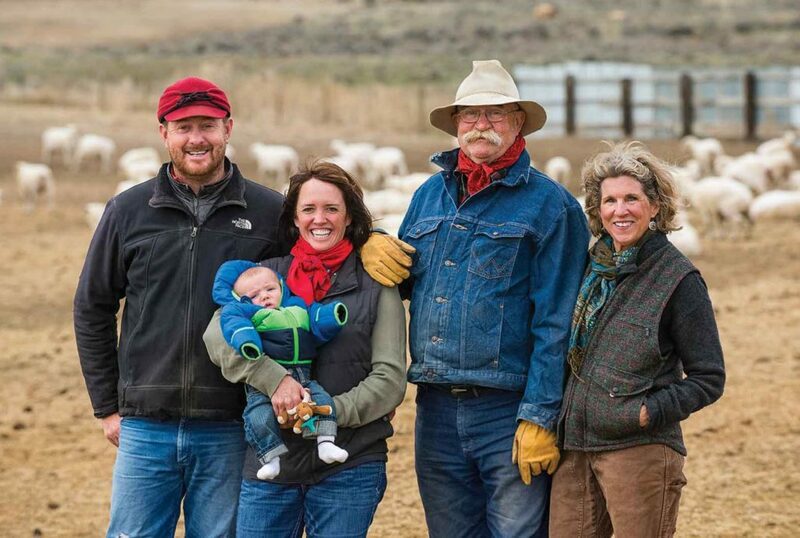 John and his son, Erik, are continuing a 130-plus year tradition of Lehfeldts raising sheep in central Montana. In 1886—about when Teddy Roosevelt and Charlie Russell were roaming the area falling in love with the rugged landscape—John’s great grandfather moved from Iowa to Montana to raise sheep. “I’ve heard he ran anywhere from 20,000 to 60,000 head of wethers for wool production,” Erik says. “His summer range stretched 200 miles.” In their heyday, the family ran the largest shearing plant in Montana, employing 10 shearers year round. It takes a village. Though the herd is only a fraction of its former glory today, it still requires an amazing amount of man—and dog—power to operate. In spring, the lots and barns are in perpetual and exhaustive motion. 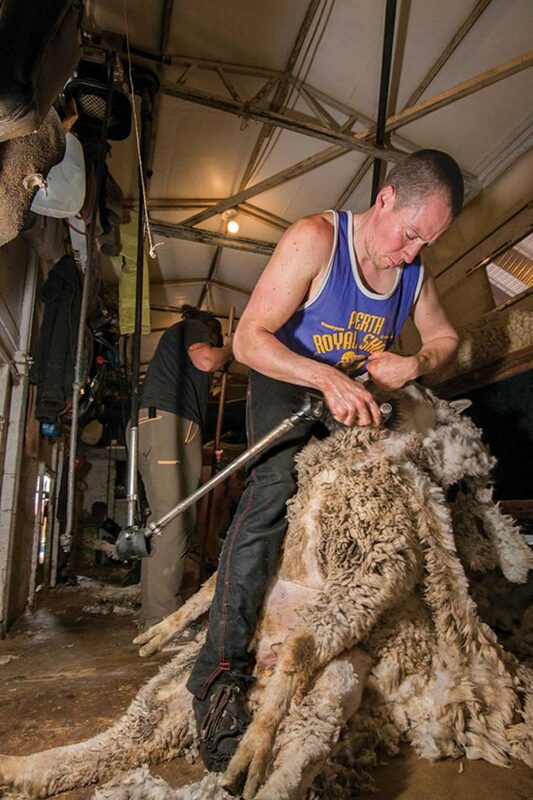 The frenzy kicks off when the shearing crews arrive in late March. Ewes are sheared three weeks ahead of lambing. “It’s a stressful time. The ewes are heavy with lamb and the weather is unpredictable,” John says. Fortunately, they have enough barn space to bring in the entire herd if the weather shifts. They also rely on an experienced shearing crew staffed by shearers from New Zealand and other strong wool producing countries. Good shearers ensure the process goes quickly and that there are fewer second cuts to degrade the quality of their premium wool product. 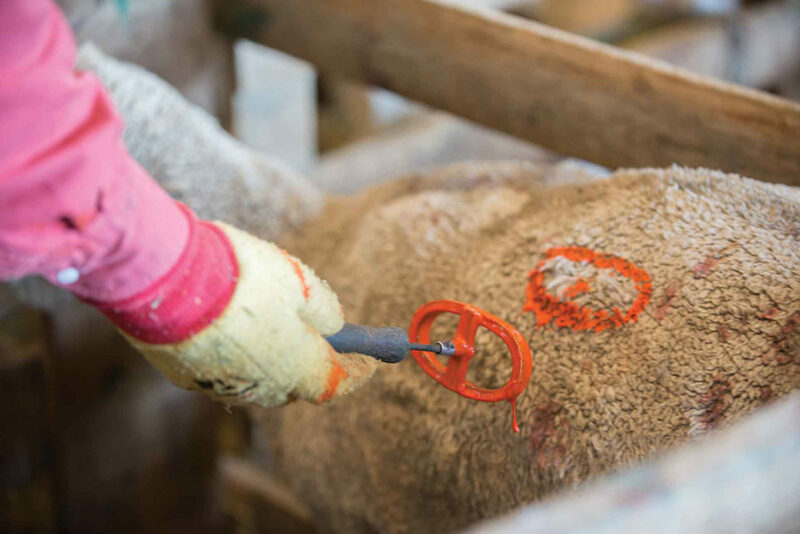 In the days before the first lamb drops, the Lehfeldts rush to brand and vaccinate their calves, vaccinate the sheep for overeating and treat for parasites. Once lambing starts, everyone settles in for the intensive daily grind. Paint brands are used to match mothers to lambs. Tractors and ATVs buzz around the lambing lot picking up newborns and their mothers in specially built trailers. They’re quickly ferried into the dark, cozy comfort of the low-slung wooden barns where a maze of 3’x4’ wooden pens fill every available inch. Men navigate the rows delivering food and water while John’s brother-in-law, Roger, assesses health and makes decisions about which ewes will be kept or culled later in the year based on their health, mothering ability and other factors. John’s sister, Wendy, spends her days crouched in the pens making sure the triplets all get up and eating while his wife, Ellen, manages the bum lamb herd resulting from their high rate of multiples. “This year we had a 180 percent lamb crop with a lot of twins, triplets and quads,” Erik says. Erik’s wife, Jaime, is a veterinarian and fills in as her schedule allows, often bringing along their son, Tom, born in December 2016. Wool legacy. For previous generations, wool was the chief money maker. Today, wool makes up just 10 percent of the ranch income, but it’s still a valued income stream they intend to make the most of. Erik’s grandfather taught him to select for prime wool characteristics when the pair would go on their ram buying trip to Texas each March. Ewes are sheared 3 weeks prior to lambing. Lambs are still where most of the income is derived. In addition to the traditional commercial markets, the Lehfeldts are pushing into some higher value local markets, too. Their lamb is offered at the Billings area food co-op Good Earth Market and at some high end local restaurants. Billings’ Last Chance Pub and Cider Mill features a Lehfeldt Lamburger. “It’s always exciting to find a new market for your product,” Erik says. Ellen also found a way to boost the bottom line. When she came to the ranch 13 years ago she sought to find something she excelled at that no one else wanted to do. She noted they were practically giving away bum lambs to people constantly wanting them for cheaper. She really enjoyed working with the bums so she started keeping them instead. Erik and Jaime’s son, Tom, makes 6 generations. He’s already put in a good amount of time in the pasture with his parents. In the old days they used to trail the sheep to the mountains, bringing along the milk cow, chickens and the whole family to watch the flock. Now they load them up on semis and mostly turn the shepherding over to their talented herders and the sheep dogs.